Our Lifetech hydrogen machine gives you all the advantages of the most therapeutic element in the world. Hydrogen can improve your skin, body odor, enhance your mental focus and muscle performance and protect your brain. It may sound impossible but is supported by thousands of studies that state oxidative stress is the cause of conditions such as diabetes, heart attack, autoimmune illness and more. Hydrogen has antioxidant powers, and by absorbing it, your body can benefit from its many positive effects. Hydrogen is the tiniest, simplest molecule in the universe. It can penetrate deeply into the cell’s inner organelles and pass the blood-brain barrier. Hydrogen is selective and reduces only the bad oxidants, leaving the good ones alone. Hydrogen stimulates your body to segregate the more natural and endogenous antioxidants such as catalase and glutathione. 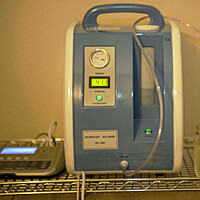 If you would like to learn more about hydrogen therapy or our other natural healing solutions, contact our team today. We’ll discuss whether it might be for you and get you scheduled for your first appointment.